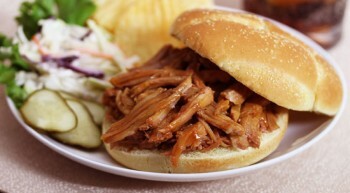 Vanee Deluxe Pulled Pork is fully trimmed, hand pulled boneless pork, slow-cooked in its own natural broth until tender and easy to shred. 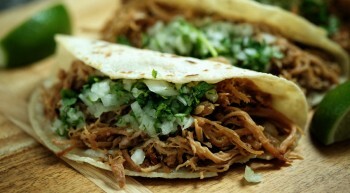 Perfect for BBQ pulled pork, tacos, enchiladas, egg or spring rolls, and soups. 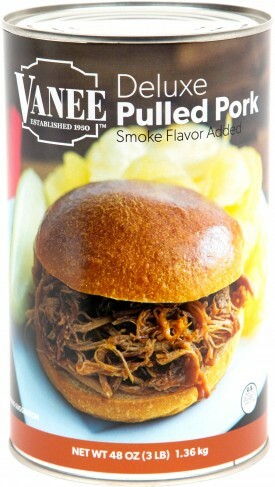 Vanee Deluxe Pulled Pork frees up valuable freezer space by being shelf-stable, has lower sodium than comparable products, is a fully usable product, and it saves you the time and labor of having to cook and pull pork yourself. Each 48 oz. 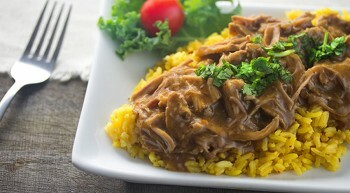 can contains around 24 quarter-cup servings, for a total of 148 servings per case. 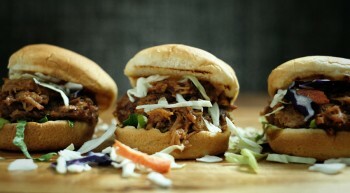 Great for pulled pork BBQ sandwiches, tacos, enchiladas, spring or egg rolls. 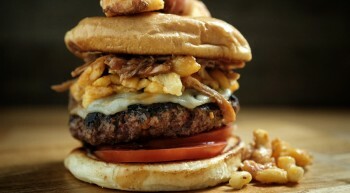 Pulled Pork, Pork Broth, Maltodextrin, Salt, Onion Powder, Spice, Natural Smoke Flavor.